As more and more content goes digital, brick-and-mortar stores are going to have to come up with new ways to sell said content. Luckily Red Touch Media can help. This Salt lake City based retail services company was at CES this week showing off their new service. They've developed a platform which will enable stores to set up a kiosk and sell movies, music and ebooks. I stopped by their booth earlier today and they gave me a tour. The demo was equal parts creepy and interesting. The creepyness comes from the face recognition features. 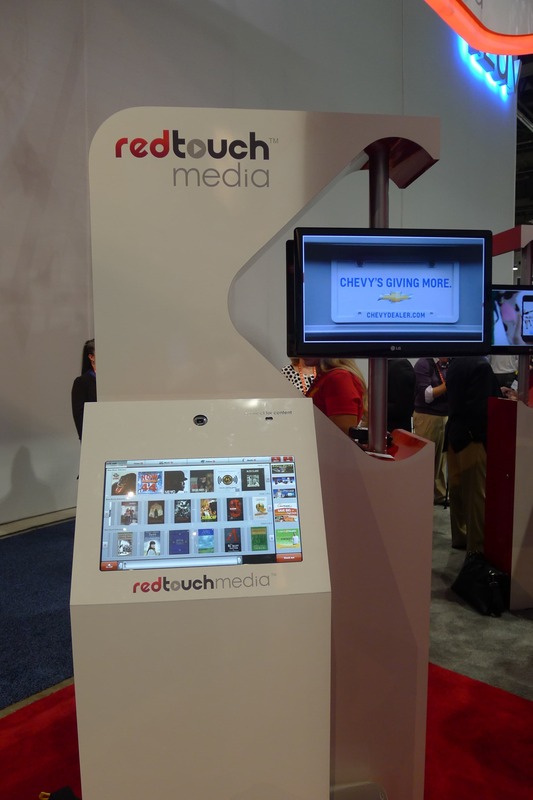 Besides just selling content, Red Touch Media has included a way for the kiosk to serve up ads based on the gender and age of the customer using the kiosk. It was quite accurate, too, and that's a good thing for the retailers which will be installing the kiosks. The kiosks on display at CES were built for the show, so they don't look like the ones which will be customized for retailers but they do offer all the same features. They're capable of selling movies music, and ebooks to customers. Customers can download the purchased content onto a thumb drive, over Wifi (hardware permitting), or they can set up an account with RTM and have the content delivered to the mobile app which RTM is planning to release soon. Given that customers can download to a thumb drive, I'm sure you're wondering about DRM. That was my first thought, so I kept bugging them until they could tell me. It turns out that the music (sold as mp3) and the ebooks (sold as Mobi) don't have DRM. Only the video content has DRM. What's even more interesting is that the mp3 music doesn't even have digital watermarks, making RTM something of an odd duck (Amazon, Apple, and Google Play all use digital watermarks). The lack of ebook DRM might explain why RTM has signed a number of movie studios and record labels but not any book publishers. In spite of what I was told, I'm going to assume that the current ebook support will end up being merely a beta test for the platform. I don't think it's very likely that RTM will be able to sign many book publishers so long as they don't wrap the ebooks in DRM and they certainly won't sign the major publishers. At the very least they are going to have to add a digital watermark feature to the platform, otherwise RTM won't be able to sign very many book publishers. All in all, it's an interesting idea and definitely a more practical way to get digital content sales into brick-and-mortar stores than the txtr-ReaderLink partnership announced earlier this week. I could easily see these kiosks standing next to the RedBox DVD rental kiosks now found in most grocery stores. I don’t know about that next to last paragraph. I can see at the very least Baen and probably Tor possibly testing it since they are DRM free already, and the small publishers Baen acts as ebook publisher for possibly testing the waters as well. I see other publishers and the rest of Simon and Schuster (Tor’s parent company) letting them test the waters and possibly joining them if things go well. You know somebody will test it and those seem like the most likely choices. If you gathered up all the publishers who are DRM free into a single list, would you describe that list as “many”? I wouldn’t. That is still only a handful of publishers. This could be a great outlet for Smashwords. Smashwords has the volume and its books are DRM free. Signing on with RTM could be a very strategic move for Smashwords, just like its library deals. Amazon has had a lot of success with its exclusivity program, but these kiosks could reach a much larger impulse-buying audience. The bored husband whose wife is clothes shopping could buy an ebook to pass the time reading on his smartphone. The real key will be how one finds the book. Smashwords needs to improve its filtering greatly to work on a kiosk system but this could give Smashwords access to a big market and make it more appealing ot authors than it already is. Yes and no. The hardware costs of the kiosk are high enough that the stores are going to want a broad selection of content which includes most popular titles. If RTM pitches this on the ability to sell movies, music, and books then they’ll need to have the major publishers signed up as well. Agreed. If you’re going to put this in stores to sell books, it needs to have “author on talk show” type books. Indie stuff just isn’t going to fly with the general public. Then again, most of their target audience couldn’t set the time on their VCRs, much less download to a flash drive. No, it’s a bad thing for retailers, actually. I know that I, for one, now that I’ve been warned, will NEVER use the kiosk, or even get too near to this abomination, if one appears in my area (unlikely, I know), and I would be advising everyone I know to do the same. I feel the same way, but on the other hand I also use a discount card at my supermarket. Google, Amazon, and a lot of other companies track me online. Really, how is the online tracking different from the face recognition stuff? I like the idea of privacy. Then again, Pandora knows more about my musical tastes than I do, and I’m okay with that. I think that Barnes & Noble should partner with this company and remove music departments from their stores. The new Nook HD/HD+ devices need a music store, and if they do this right, B&N can eliminate the physical cost of carrying non-profit making low-margin items like CD’s. And then use the Microsoft/Nook partnership effectively, replacing those CD’s with XBox games and systems.